Speed errors encountered in recordings and upon playback can be caused by many problems. Examples include faulty tape recorder transports, sticky tapes, electrical problems in analogue recording devices, and off-centre holes in disks that lead to wow. In each case, the recording or the replayed audio exhibits speed changes with respect to what would have been recorded or replayed had the fault not existed. Respeed automatically identifies - or allows the user to identify - unwanted speed changes contained within the presented audio. Once these have been determined the track may be processed many times faster than real-time. The result is greater pitch stability and, when used on speech signals, improved intelligibility. However, musical pitch variations such as vibrato and glissandos are left unaffected. Respeed incorporates three modes of processing, including an Advanced mode that handles many tracks without user intervention. In addition, a powerful range of tools are also provided, and these allow the user to adapt the process for almost any track that contains speed errors. 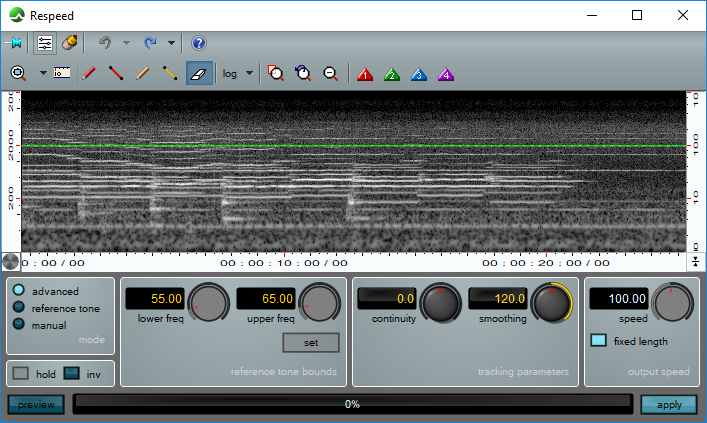 With two powerful new functions - Hold and Invert - Respeed is also capable of creating a speed correction template using one audio file and applying it to another. Amongst other things, this allows users to correct the speed of multi-track material held in separate files before mixing. It is also able to invert a template and reapply it, which makes it possible to correct unusual problems such as wandering tones before returning the audio to its original state.